Allium tuberosum is a rhizomatous, clump-forming perennial plant growing from a small, elongated bulb (about 10 mm, 13⁄32 inch, across) that is tough and fibrous. Unlike either onion or garlic, it has strap-shaped leaves with triangular bases, about 1.5 to 8 mm (1⁄16 to 5⁄16 in) wide. It produces many white flowers in a round cluster (umbel) on stalks 25 to 60 cm (10 to 24 in) tall. It grows in slowly expanding perennial clumps, but also readily sprouts from seed. In warmer areas (USDA zone 8 and warmer), garlic chives may remain green all year round. In cold areas (USDA zones 7 to 4b), leaves and stalks completely die back to the ground, and resprout from roots or rhizomes in the spring. Originally described by Johan Peter Rottler, the species name was validly published by Curt Polycarp Joachim Sprengel in 1825. A. tuberosum is classified within Allium in subgenus Butomissa (Salisb.) N. Friesen, section Butomissa (Salisb.) Kamelin, a group consisting of only A. tuberosum and A. ramosum L., which have been variously regarded as either one or two genetic entities. A. tuberosum originated in the Siberian–Mongolian–North Chinese steppes, but is widely cultivated and naturalised, ‘It has been reported as growing wild in scattered locations in the United States (Illinois, Michigan, Ohio, Nebraska, Alabama, Iowa, Arkansas, and Wisconsin). However, it is believed to be more widespread in North America because of the availability of seeds and seedlings of this species as an exotic herb and because of its high aggressiveness. This species is also widespread across much of mainland Europe and invasive in other areas of the world. A late summer- to autumn-blooming plant, A. tuberosum is one of several Allium species known as wild onion and/or wild garlic that, in various parts of the world, such as Australia, are listed as noxious weeds or as invasive “serious high impact environmental and/or agricultural weeds that spread rapidly and often create monocultures”. Often grown as an ornamental plant in gardens, several cultivars are available. A. tuberosum is distinctive by blooming later than most native or naturalised species of Allium. 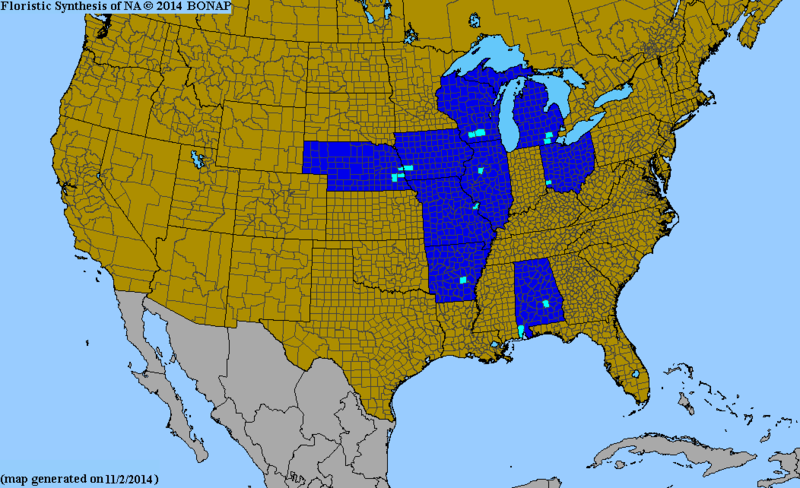 It is cold-hardy to USDA zones 4–10 (−30 to +35 °F, −34 to 2 °C). Garlic chives are regarded as easy to grow in many conditions and may spread readily by seeds or can be intentionally propagated by dividing their clumps. A number of varieties have been developed for either improved leaf (e.g. ‘Shiva’) or flower stem (e.g. ‘Nien Hua’) production. While the emphasis in Asia has been primarily culinary, in North America, the interest has been more as an ornamental. ‘Monstrosum’ is a giant ornamental cultivar. Uses have included as ornamental plants, including cut and dried flowers, culinary herbs, and traditional medicine. Garlic chives have been widely cultivated for centuries in East Asia for their culinary value. The flat leaves, the stalks, and immature, unopened flower buds are used as flavouring. Another form is “blanched” by regrowing after cutting under cover to produce white-yellow leaves and a subtler flavor. Pronunciation of the Chinese names for A. tuberosum, 韭菜, vary between Mandarin Chinese and Cantonese, as well as other dialects. For instance, the green leaves are jiu cai, the flower stem jiu cai hua, and blanched leaves jiu huang in Mandarin, but gau tsoi (kow choi), gau tsoi fa, and gau wong in Cantonese, respectively. Other renderings include cuchay, kucai, kuchay, or kutsay. The leaves are used as a flavoring in a similar way to chives, scallions, or garlic, and are included as a stir fry ingredient. In China, they are often used to make dumplings with a combination of egg, shrimp, and pork. They are a common ingredient in Chinese jiǎozi dumplings and the Japanese and Korean equivalents. A Chinese flatbread similar to the scallion pancake may be made with garlic chives instead of scallions; such a pancake is called a jiucai bing (韭菜饼) or jiucai you bing (韭菜油饼). Garlic chives are also one of the main ingredients used with yi mein (E-Fu) dishes. In Manipur and other northeastern states of India, it is grown and used as a substitute for garlic and onion in cooking and is known as maroi nakuppi in Manipuri. In Japan, where the plant is known as nira (韮), it is used for both garlic and sweet flavours, in soups and salads, and Japanese Chinese dishes such as gyōza dumplings. 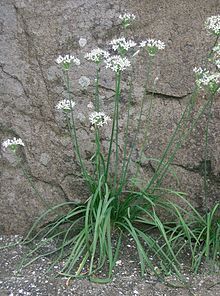 Known as buchu (부추), garlic chives are widely used in Korean cuisine. They can be eaten fresh as namul, pickled as kimchi and jangajji, and pan-fried in buchimgae (pancake). they are also one of the most common herbs served with gukbap (soup with rice), as well as a common ingredient in mandu (dumplings). In Nepal, cooks fry a curried vegetable dish of potatoes and A. tuberosum known as dunduko sag. In Thailand, they are known as gui chai. In Vietnam, the leaves of garlic chives, known as hẹ, are cut up into short pieces and used as the only vegetable in a broth with sliced pork kidneys. In Kazakhstan, where the plant has been introduced through cultivation by Dungan farmers and ties with neighboring China, garlic chives are known by a transliteration of their Mandarin Chinese name, djutsey (джуцей). Used in cooking, it is sometimes added as a filling to manty, samsa, yuta, and other typical dishes. ^ a b c WCSPF 2015. ^ a b Linnaeus 1825. ^ a b Xu, Jiemei; Kamelin, Rudolf V. “Allium tuberosum“. Flora of China. 24 – via eFloras.org, Missouri Botanical Garden, St. Louis, MO & Harvard University Herbaria, Cambridge, MA. ^ “Allium tuberosum“. Germplasm Resources Information Network (GRIN). Agricultural Research Service (ARS), United States Department of Agriculture (USDA). ^ a b c PFAF 2012, Allium tuberosum – Rottler. ex Spreng..
^ a b Floridata 2015, Steve Christman. Allium tuberosum 12 December 2003. ^ a b McGee & Stuckey 2002. ^ Soule, J.A. (2016). Month by Month Guide to Gardening in the Southwest. Cool Springs Press. ^ a b Friesen, Fritsch & Blattner 2006. ^ a b Fritsch & Friesen 2003. ^ a b USDA 2015. ^ a b Hilty 2015. ^ “Allium tuberosum“. County-level distribution map from the North American Plant Atlas (NAPA). Biota of North America Program (BONAP). 2014. Retrieved 15 October 2015. ^ a b Randall 2007. ^ Larkcom & Douglass 2008, p. 80. ^ a b Larkcom & Douglass 2008, p. 75. ^ Larkcom & Douglass 2008, p. 78. Linnaeus, Carl (1825). Sprengel, Curt Polycarp Joachim (ed.). Systema Vegetabilium vol. ii (16th ed.). Göttingen: Sumtibus Librariae Dieterichianae. p. 38. Retrieved 14 October 2015. Block, Eric (2009). Garlic and other alliums : the lore and the science. Cambridge: Royal Society of Chemistry. ISBN 978-0-85404-190-9. Brewster, James L. (2008). “Chinese chives, Allium tuberosum Rottl.”. Onions and other vegetable alliums (2nd ed.). Wallingford, UK: CABI. p. 20. ISBN 978-1-84593-622-8. Retrieved 14 October 2015. Kays, Stanley J. (2011). “7.13 Allium tuberosum“. Cultivated vegetables of the world: a multilingual onomasticon. Wageningen: Wageningen Academic. p. 33. ISBN 9789086867202. Larkcom, Joy; Douglass, Elizabeth (2008). Oriental vegetables : the complete guide for the gardening cook (2nd ed.). New York: Kodansha International. ISBN 978-1-56836-370-7. Retrieved 17 October 2015. Majupuria, Indra (1993). Joys of Nepalese cooking : a most comprehensive and practical book on Nepalese cookery : 371 easy-to-make, kitchen-tested recipes. Lashkar (Gwalior), India: S. Devi. ISBN 9789747315318. Retrieved 18 October 2015. McGee, Rose Marie Nichols; Stuckey, Maggie (2002). The Bountiful Container. Workman Publishing. ISBN 978-0-7611-1623-3. Rabinowitch, H. D.; Currah, L. (2002). Allium Crop Sciences: Recent Advances. CABI Publishing. ISBN 0-85199-510-1. Randall, RP (2007). The introduced flora of Australia and its weed status (PDF). Australian Weed Management, University of Adelaide. ISBN 978-1-920932-60-2. Retrieved 15 October 2015. Zeder, Melinda A.; Bradley, Daniel G; Emshwiller, Eve; Smith, Bruce D, eds. (2006). Documenting domestication: new genetic and archaeological paradigms. Berkeley, Calif.: University of California Press. ISBN 978-0-520-24638-6. Retrieved 14 October 2015. Friesen, N; Fritsch, RM; Blattner, Frank R (2006). “Phylogeny and new intrageneric classification of Allium (Alliaceae) based on nuclear ribosomal DNA ITS sequences” (PDF). Aliso. 22: 372–395. Retrieved 13 October 2015. Li, Q.-Q. ; Zhou, S.-D.; He, X.-J. ; Yu, Y.; Zhang, Y.-C.; Wei, X.-Q. (21 October 2010). “Phylogeny and biogeography of Allium (Amaryllidaceae: Allieae) based on nuclear ribosomal internal transcribed spacer and chloroplast rps16 sequences, focusing on the inclusion of species endemic to China”. Annals of Botany. 106 (5): 709–733. doi:10.1093/aob/mcq177. PMC 2958792. PMID 20966186. Oyuntsetseg, B; Blattner, F. R.; Friesen, N. (2012). “Diploid Allium ramosum from East Mongolia: A missing link for the origin of the crop species A. tuberosum?”. Erforsch. biol. Ress. Mongolei (Halle/Saale). 12: 415–424. Saini, N; Wadhwa, S; Singh, G. K. (2013). “Comparative study between cultivated garlic (Allium sativum) and wild garlic (Allium tuberosum)”. Global R Trad Rep. 1 (1): 12–24. Archived from the original on 2016-03-04. Retrieved 2015-10-14. “The Plant List: A Working List of all Plant Species v. 1.1”. 2013. “USDA PLANTS database. Allium tuberosum“. “Floridata”. Floridata Plant Encyclopedia. 2015. “Plants For A Future”. Retrieved 6 October 2015. RHS (2015). “Allium tuberosum (Chinese chives)”. Royal Horticultural Society. Retrieved 14 October 2015. Hilty, John (2015). “Garlic chives”. Illinois Wildflowers. Retrieved 14 October 2015. “Allium tuberosum Rottler ex Spreng”. Schede di botanica. Flora Italiana. Archived from the original on 30 March 2014. Retrieved 15 October 2015. Norrington-Davies, Tom (8 April 2006). “Spring it on them”. The Telegraph. Retrieved 17 October 2015. Maangchi (26 February 2008). “Asian chives”. Retrieved 18 October 2015. “Chinese Chives – Hẹ”. Vietnamese Herbs. 2015. Retrieved 18 October 2015. Goh, Kenneth (30 March 2015). “Shredded Chicken Braised E-Fu Noodles (鸡丝韭黄伊府面）”. Guai Shu Shu. Retrieved 18 October 2015. Mahr, Susan (30 August 2010). “Garlic Chives, Allium tuberosum”. University of Wisconsin Extension Master Gardener Program. Retrieved 19 October 2015. “Allium tuberosum”. Missouri Botanical Garden. Retrieved 19 October 2015. Miller, Sally G (14 June 2014). “Garlic Chives- Great In the Garden, But…” Dave’s Garden. Retrieved 19 October 2015. “Allium tuberosum”. Hortipedia. Retrieved 19 October 2015. “Allium tuberosum ‘Monstrosum‘“. Staudengärtnerei Gaißmayer. 2015. Retrieved 19 October 2015.